The folks over at GoNintendo have posted a fan created 25th Anniversary Legend of Zelda 3DS. GoNintendo is labeling this as custom made and not something that will officially be released. However, it appears there are rumors floating around that there might in fact be a Legend of Zelda themed Nintendo 3DS. 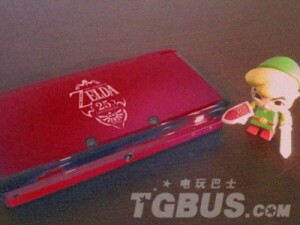 This particular custom made 3DS has a bright shiny red color along with the Legend of Zelda 25th anniversary crest. Should an anniversary edition 3DS be released by Nintendo we would expect it to come with a copy of Ocarina of Time 3D and maybe some extra goodies. The last Zelda special edition console was the gold Nintendo DS Lite that was emblazoned with the Triforce and it included a copy of Phantom Hourglass. If something like this did release, would you pick it up? Do you think it would be a good idea, considering the Nintendo 3DS is still brand new? Let us know by posting in the comments below.